Ken Johnson was born on March 23, 1938, in Minneapolis, Minnesota. He enlisted in the Minnesota Air National Guard on September 20, 1955, and received an honorable discharge on July 14, 1957, in order to enter the U.S. Air Force Academy. He received his commission as a 2d Lt in the U.S. Air Force on June 7, 1961. Lt Johnson next completed Undergraduate Pilot Training and was awarded his pilot wings at Moody AFB, Georgia, in July 1962, followed by F-100 Super Sabre Combat Crew Training from August 1962 to August 1963. His first assignment was as an F-100 pilot with the 494th Tactical Fighter Squadron at RAF Lakenheath, England, from August 1963 to September 1966, and then as an F-100 pilot with the 510th Tactical Fighter Squadron at Bien Hoa AB, South Vietnam, from September 1966 to January 1967. 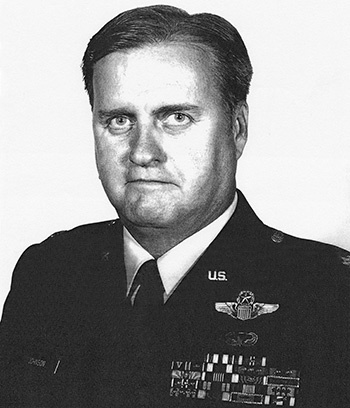 Capt Johnson next served as an F-100 pilot and as a Staff Operations Officer with the 3rd Tactical Fighter Wing at Bien Hoa from January to September 1967, followed by service as an O-1 Bird Dog Forward Air Controller and Air Liaison Officer with the 82nd Airborne Division at Fort Bragg, North Carolina, from October 1967 to March 1969. His next assignment was as an F-5 Freedom Fighter Instructor Pilot training international personnel with the 425th Tactical Fighter Training Squadron at Williams AFB, Arizona, from March 1969 to September 1971, and then as an F-4 Phantom II pilot with the 555th Tactical Fighter Squadron at Udorn Royal Thai AFB, Thailand, from September 1971 until he was forced to eject over North Vietnam and was taken as a Prisoner of War on December 18, 1971. After spending 453 days in captivity, Maj Johnson was released during Operation Homecoming on March 14, 1973. He was briefly hospitalized to recover from his injuries at Scott AFB, Illinois, and then served as an F-104 Starfighter Instructor Pilot, training West German pilots with the 69th Tactical Fighter Training Squadron at Luke AFB, Arizona, from July 1973 to July 1977, followed by service as an F-4 Phantom II pilot with the 81st and 480th Tactical Fighter Squadrons and as Wing Plans Officer for the 52nd Tactical Fighter Wing at Spangdahlem AB, West Germany, from August 1977 to July 1979. After completing French Language School with the Defense Language Institute at Monterey, California, LtCol Johnson served as an Air Liaison Officer with the 602nd Tactical Air Control Wing at Fort Ord, California, from January to June 1980, and then as an Air Force Liaison Officer at Tunis, Tunisia, from July 1980 to June 1982. His final assignment was as Commander of Detachment 5, 507th Tactical Air Control Wing, at Fort Campbell, Kentucky, from June 1982 until his retirement from the Air Force on February 1, 1985. Ken Johnson died on August 29, 2015, and was buried at Arlington National Cemetery. Captain Kenneth R. Johnson distinguished himself by gallantry in connection with military operations against an opposing armed force as an F-100 pilot in Southeast Asia on 7 August 1967. On that date, Captain Johnson was scrambled from the alert pad at 0205 hours and 0515 hours in support of Tong Le Chan special forces camp which was under heavy attack by an unknown number of hostile forces. The flare ship had to remain above the low overcast, so, it was necessary for Captain Johnson to use the fires burning in the camp and the hostile muzzle flashes as references. Captain Johnson delivered his bombs, napalm, and 20mm against the hostile gun positions and along the wall of the camp perimeter in extremely close proximity to friendly forces. During the two missions, Captain Johnson made nine low level passes at extremely low altitude against intense hostile fire and friendly cross-fire while delivering his ordnance with precision accuracy. By his gallantry and devotion to duty, Captain Johnson has reflected great credit upon himself and the United States Air Force.